This page shows an exciting assortment of jewelry that incorporates TURQUOISE, birthstone for the month of December (along with BLUE TOPAZ)! Turquoise can be found in colors from sky blue to bluish-green, most rare in a pure blue color. Turquoise is porous, so avoid contact with liquids and oils, remove when washing. Natural turquoise is commonly bonded to increase durability of color over time. 3-1/8 inches long, 1-1/4 inch across, a graceful loop of nontarnish brass wire is covered with faceted CARNELIAN, SMOKY QUARTZ and BLUE CHALCEDONY along with TURQUOISE. A vine of tiny green seed beads surrounds the loop. 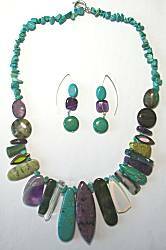 Dangling at the bottom are TURQUOISE and PREHNITE roughly faceted, AMETHYST cut cubes. A chain tassel at the top, earring hanges from goldfill earwire, and they are lightweight! Single strand 18 inch necklace of TURQUOISE mixes shapes and colors, the left and right sides are different but balanced nicely. Toward the back are faceted briolette-like shapes in turquoise green color with matrix. Then there are some flat teardrops, rondelles and faceted rondelles, in shades of light greeen to rich blue. At the very front are flat teardrops up to 1-1/4 inches long in matrix dark blue-green, surrounded by chunky rectangles and ovals. One larger flat rectangle has intriguing spotted colors in light green, bright turquoise, gold and peach. Sterling silver toggle clasp. Combine any Purse Charms to save! 8-3/4 inches long including goldtone clasp. The colors are turquoise and lavender. There are turquoise gemstone nuggets, flat round stone beads with dyed color designes, amethyst and lavender jade, golden charms of wine in a bucket and handmade, crystal clusters. Necklace is 20 inches long, the larger stones span 10 inches of front and hang 2 inches at the center. Turquoise chips finish the back with silver toggle clasp. The asymmetrical appeal comes from different lengths and shapes of natural gemstones that include SHELL, TURQUOISE HOWLITE, WOOD JASPER, AMETHYST, GLASS, GREEN HOWLIGHT, OCEAN JASPER, AMAZONITE, MOONSTONE GLASS, CHITA STONE, SUGILITE and QUARTZ. Earrings dangle 2-1/4 inches long on sterling earwires with dramatic curving back, show off the shapes of TURQUOISE HOWLITE and FLUORITE. 1-3/4 inches long on sterling earwire. A piece of brass 3/8 inch across has embossed patterns and oxidized finish to show it off, below turquoise stone and millefiore glass bead on iron wire. 14kt yellow gold setting surrounds a sparkling faceted oval CITRINE, about 11x9mm with open setting to let light through the back. CHINESE TURQUOISE beads dangle below, earrings are 1-1/4 inches long on shield-front leverback earwires. 8 inches long including goldtone clasp. The colors are turquoise blue and aqua. There are turquoise gemstone nuggets, art glass and crystals. 1-1/2 inches long including nickel-free surgical earwire, 5/8 inch across. TURQUOISE cabochon rests in simple bezel cup, swinging atop fancy darkened silver filigree and a matte turquoise color teardrop. About 21 inches long, but with the zig-zag style of each strand there is opportunity to relax a bit longer or twist tighter! 9 strands are beaded with shiny small glass beads, folded along the way into points that end with larger beads and gemstone chips. Strong back magnetic clasp for easy on and off, is hidden in beaded caps. The glass bead colors include turquoise and dark bronze, stones include turquoise and tigerseye. 1-7/8 inches long including nickel-free surgical earwire, 3/16 inch across. Silver metal infinite loop swings across the turquoise enamel panel with small silver pearl drop. By The Artful Soul, necklace is mixed media polymer clay and resin. Pendant measures 1-7/8 inches long made on neutral polymer clay base. Emerald green and gold metallic powders adorn the bottom, a TURQUOISE cabochon at center, and golden metallic powders with leaves at the top have small navy blue Swarovski crystal accent. Suspended on 17 inch goldfill chain (plus 2 inch extender) with Chinese turquoise and glass beads at front. By The Artful Soul, 18 inch beaded necklace featuring natural TURQUOISE in nugget and Chinese turquoise round beads, natural and bleached MOTHER OF PEARL, and goldfill. Most beads are about 8mm in size. Golden pewter toggle clasp.